Fish is known to be one of the most light-weight ways of adding protein to one’s diet and of course fish oils are very important. Salmon is renowned for being Omega-3 fatty acids and is a very tasty filling fish. Grilled, broiled, baked, or poached, salmon makes an excellent meal for dining in or out. 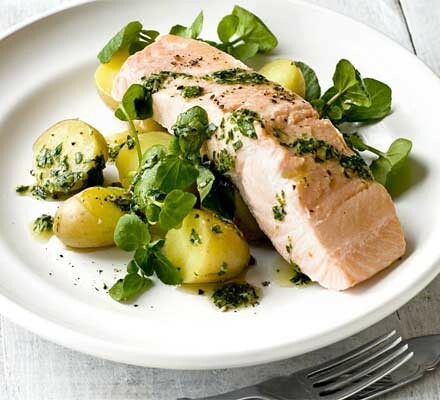 For a quiet dinner for two at home try this poached salmon. All that is needed is 1 to 1½ pounds salmon fillets, pin bones removed, Salt, ½ cup dry white wine, ½ cup water, several thin slices of yellow onion and/or 1 shallot, peeled and thinly sliced, A few sprigs of fresh dill or a sprinkle of dried dill, A sprig of fresh parsley, and freshly ground black pepper. To prepare: first the salmon fillets with salt. Then place wine, dill, water, onions, and parsley in a saucepan and sauté over a medium flame. Next add the salmon fillets with the skin-side down in the pan and cover, cooking for 5-10 minutes depending on the fillets’ thickness. Be careful not to overcook and serve with freshly ground black pepper.